When the Virtual pet craze hit it's peek in the 90s, Disney decided to jump on the band wagon and released a bunch of virtual pets with Disney related characters. Toy Story was one of those movies. This virtual pet has 3 characters you can play with. "The Claw" randomly selects one for you to raise: 1) an alien, 2) an alien duck or 3) an alien pooch. They are all pretty cute in my opinion. I think you can pause this one. You have to constantly clean the air supply because they are on a space ship lol You also have to keep your character fit because it's hard to get exercise in outer space I guess. All in all I give it a 7 out of 10. I love the nice huge screen and the characters are cute, but the shell is a tad bulky and I don't think it has an actual clock for telling time. I'm not sure if the characters evolve or not because I never played with it long enough to find out. I got mine for about $15 if I recall correctly. I rarely see them on eBay but they generally go for $34-50. If they are not less than $30 then I wouldn't bother with this one because the seller is too expensive. 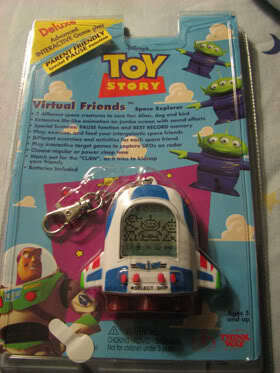 If you REALLY want this virtual pet, hold out until you find one for around $15-20. It is a nice virtual pet to own, but if I had only found one for $50 I would not have bought it. That's just too expensive.